Halloween is just over a week away! We would love to see how you have transformed your warm fall home into a spooky October setting – have you purchased all of your decorations or do you prefer to DIY? Glittered Pumpkins: This isn’t strictly Halloween of course – glittered pumpkins make wonderful fall decorations too – but if you’re not afraid to get a little (a lot) sparkly, try out this project and add ribbon, decals or other accents to make it more personal and perhaps more spooky. 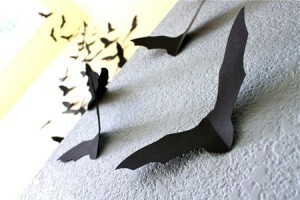 Paper Bats: For a wall, door or even your glittered pumpkins, this batty template gives you the option of choosing your own paper with which to create these little creatures. We think the finished mural looks awesome when put together! 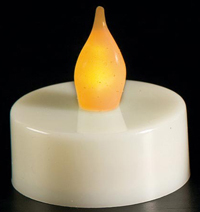 Candle Lampshade: Again, this can be adapted for any season or holiday. Choose some scary scrap-booking paper for the lampshade, and we recommend battery-operated tealights for longer and safer use. 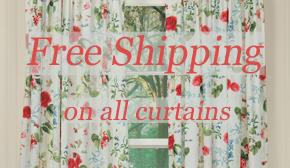 When finished, you will have charming accents for a dining room centerpiece or hallway table. Rustic Charm: Both of these projects require a bit more handiwork, but are definitely worth the time. Wood Candy Corn Signs are irresistibly appealing, and when used in multiples around a candy dish they look simply wonderful. 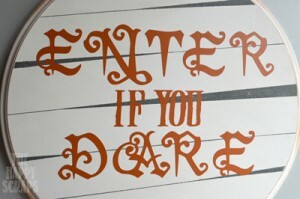 The Enter if You Dare sign is equally festive, and you could alter the words for your own or another seasonal expression; a great thing about these DIY’s (and really every other DIY) is that they are flexible for decorating throughout the year. Let us know your favorite DIY Halloween project, and show us your displays if you tried any of these! This entry was posted on Thursday, October 22nd, 2015 at 9:57 am	and is filed under Apartment, Art, Bathroom, Bedroom, Candles, Crafting, DIY, Decorating, Dining Room, Holiday Decorating, How To, Seasonal Decorating, Thematic, Thursday's Theme. You can follow any responses to this entry through the RSS 2.0 feed. You can leave a response, or trackback from your own site.